MANILA, Philippines - Tanduay Alab Pilipinas bounced back big time after a sorry loss against Singapore Slingers few of days ago as the Filipinos torched the Mono Vampire Basketball Club, 114-87 in the ASEAN Basketball League (ABL) on Sunday, January 14, 2018 in Bangkok City Thailand. Mono Vampire is not an easy task for Alab to accomplish, as the Thai Basketball team has Samuel Deguara, a 7’4” center who can make life harder for Filipino cagers especially under the basket. With Deguara on Mono Vampire, Coach Jimmy Alapag had to tweak his starters to match the height advantage of the Thai Team. Coach Alapag tapped the seldomly used Rico Maierhofer to man the middle. Maierhofer savored the rare opportunity that his coach game him and paid him back with 5 points and a block on Deguara. Alab had the advantage early on with a 20-11 scoring run. Mono Vampire caught-up with Alab led by former UE Red Warrior Paul Zamar and Fil-Am Jason Brickman who became a real threat on both offensive and defensive sides that worried Coach Alapag. Despite the Thai-run, Philippines managed to get back and ended the opening period with a 10-point, 32-22 lead. Justin Brownlee and Josh Urbiztondo bumped-up the lead to 16 as Alab started the 2nd quarter but Ex-Barako Bull import Mike Singletary retaliated to cut the numbers down. Thailand may have a giant on the floor all the time, but surprisingly, Philippines outrebounded Mono Vampire and converted them into second-chance points to blow the lead to its largest at 18 before the 2nd quarter expired. Tanduay Alab Pilipinas held on to its lead, 54-37 after the first 20 minutes of the ballgame. Thailand was firing back at Philippines come 3rd quarter. The only problem was: the locals were not contributing. In contrast, Tanduay Alab’s guards, Josh Urbiztondo and Bobby Ray Parks Jr. were in full blast in supporting the tenacity of Renaldo Balkman and Justin Brownlee. Justin Brownlee was too quiet in the 1st half. But he got back on his feet and dropped significant digits in the third to help Alab posted a 20-point lead. Bobby Ray Parks Jr. also tallied his 19th point of the game from the outside with 3 more minutes remaining in the 3rd quarter. With that trey, Parks Jr. surpassed his 16th-point game performance versus Slingers. Outstanding penultimate quarter for Philippines as the nationals escalated their lead, 88-62. Justin Brownlee was simply unstoppable in the 2nd half. 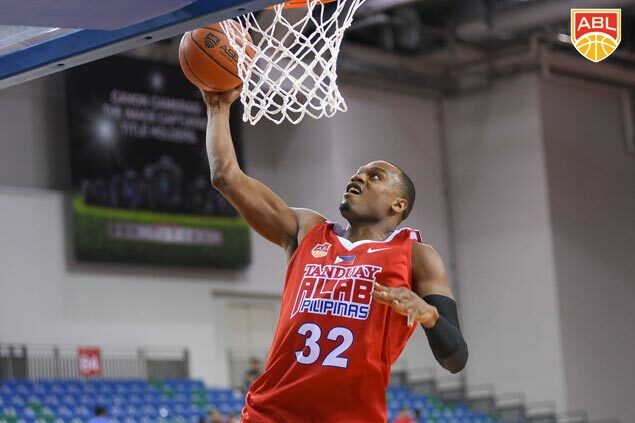 Brownlee turned into a scoring machine who got his points from both the inside and the outside to help Philippines reached the century mark. With 4 minutes remaining in the game, Alab’s advantage had ballooned to 32 points. Coach Jimmy Alapag opted to rest his gunners and sent his 3rd unit in to finish the game. PBA Veteran Dondon Hontiveros led the crew as Alab closed out the game, 114-87 and posted Philippines’ 4th win together with 4 losses. Alab Pilipinas will face CLS Knights next on January 20.